I could not have wished for more interesting and intriguing markings from the rough block I chose for Sailboat Tempest. The sheer force and turbulence these bold intrusions bring to the carving bear witness to the violent geological history that brought Colorado Yule Marble to life. For these amazing intrusions are in actual fact remnants of the liquid granite, or magma – yes, the very same substance currently holding up and floating our continental plates – that oozed from deep within the bowels of the earth. In doing so, fortunately for us, a relative speck of limestone that we now know as Yule found itself trapped and encapsulated in an unimaginably hot bed of molten rock. Tremendous were forces at play, so vast the timescale, temperatures, weights and pressures, that it was during this prolonged geological event that everything from dust, flecks and particles of this magma intrusion, in a process called contact metamorphism, forced their way into the marble and are exactly what you see so beautifully laced and interwoven throughout every inch of extremely rugged marble bowl. Note the darkesh grey ceiling, complete with tool marks from the moment when marble was split from its granite roof. I believe I am able to calculate roughly from where in the Yule marble quarry the Maiden Collection slab Sailboat Tempest dwelt for 30 million years or so. It is my educated guess that, with so many huge chunks of practically unscathed granite, along with the sheer density of the layering, the slab was cut from the roof of the quarry chamber, at a point where Yule’s famed 99% pure white calcite marble begins, and the granite ends. For along with producing many such highly stratified rough blocks, which in turn produced their own distinctive category within the collection, this magnificent slab of well seasoned marble was to produce a great many carvings of quite the finest, purest and whitest marble imaginable. And so here we have an ancient tempest below ground that serves nicely to illustrate an aquatic tempest above. This formidable rough block in fact contained so much granite, and had such striking markings, that a storm seemed to whip up as I carved, and the more I explored the swirling patterns, the clearer a vision of a sailboat, battered by a raging sea, soon began to crystallize before my eyes. 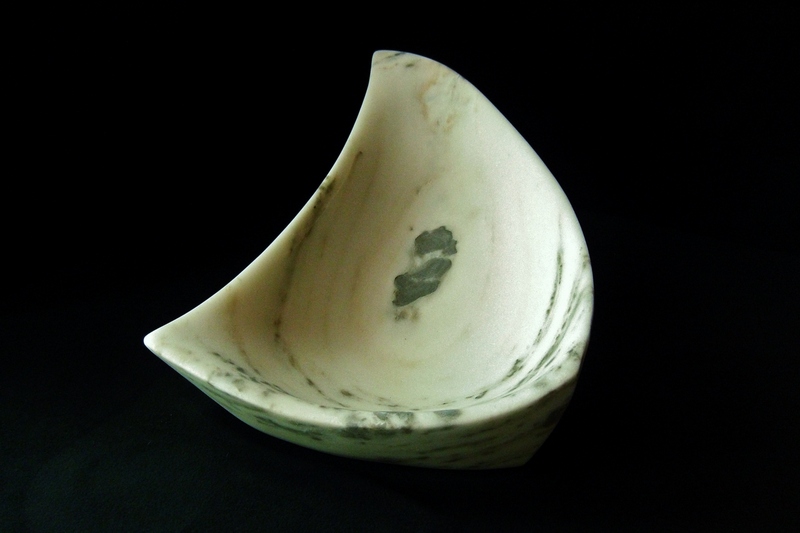 This entry was posted in Gallery 1: The Maiden Collection, Gallery of Boats, Gallery of Bowls, Gallery of Curvilinear Marble Sculpture, Gallery of Marble Sculpture, Gallery of Sculpture, Gallery of Sculpture FOR SALE, Gallery of Whimsy, Marble Bowls FOR SALE and tagged Art, Artist, Aspen, carving, Colorado, curvilinear, direct method, fine art, for sale, Hand Carved, Marble, marble bowl, Martin Cooney, reductionist, sculptor, Sculpture, Stone, Woody Creek, Yule marble. Bookmark the permalink.